With financial support from The Carter Family Foundation, The Community Foundation for Crawford County, The Crawford Partnership for Education & Economic Development, Hord Family Farms, The Shunk Foundation, and United Way of Crawford County, Crawford Works was implemented as a pilot program to determine whether the program components could be scaled to a community the size of Crawford County, and to determine whether the program would be effective in reducing poverty in our community. “Crawford Works is about building lasting support through relationships. With help from our local businesses and community members, we can continue to transform our community one life at a time,” said Annie Carter, president of Carter Machine and a Crawford Works employer partner. Crawford Works is hosting an “Evening of Impact” on Oct. 23 at the Hord Family Farms Community Center to kick off the “One Life at a Time” campaign, to recognize partners and members, and to increase awareness of the organization’s work. 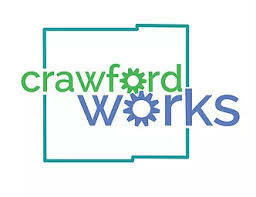 For more information, contact Crawford Works at crawfordcoworks@gmail.com or call 419-310-4653.